Yes. Trader. As mentioned earlier, I've not exactly been a trader and not very well versed in TA. To prepare myself, I've taken plenty of time recently to understand the crypto market, technology behinds it and picking up various TA skills, discipline and risk management before my foray into the crypto world. The week had been a really interesting week for the crypto world. Seeing BCH battle out with BTC earlier and the rise of several alt coins. Earlier this week, I've made plans to devote some time into crypto-trading after weeks of practicing and monitoring. And hereby, now, I'll be writing about the results, thoughts and lesson from based on the trades executed. Do note that for the trades executed in the past week, 95% of the analysis done is based on TA, and I will not go into detail of showing/explaining with charts for the transactions that had already been executed. So how's my week in "timing the market" ? Note: Transaction fees are factored into the price of buying/selling. I've executed 2 day trades for USD/BTC and BTC/ETC and a short term trade for ETH. Do note that I've no stop-loss as I'm prepared to lose every single cent. A fluctuation of 10-20% in an hour is pretty common for cryptocurrency. Entered at 5,750 with a TP of 6,250. As I believe that BTC will be bouncing around and might settle for a lower price. However, just after I've sold, Bitcoin actually rallied and moving towards the 7000 mark. If anyone realize, BTC today is hovering around the 8000 mark and this will translates to about 39% gain if I'm holding onto BTC. Entered at 15.01 with a TP of 17.80. TA was done on ETC right before exiting position with BTC and heavy support was seen at 15 range with positive divergence. Another note to add on, is a small speculative flavor for the ETC Summit that is taking place back then. Entered at 316.96 with a TP of 360.00. Ethereum is something that I had been monitoring for some time and with several attempt of breaking the 310 and 315 resistance earlier, they finally succeeded in breaking the wall and went as high as 320. Consolidation can be seen at the 315 range and symmetrical triangle are seen prior to entering the trade. ETH seem to be awaiting for a breakout. A day after the trade, ETH is looming around 33X range. Was planning to take profit and move onto LTC, which is displaying a similar pattern at the 6X range. However, I stayed onto Ethereum, believing that there should be another breakout in days. Exited at 360.00 on 19/11/17 after another breakout. 1. Lessons learnt: Be discipline. If you miss the boat, so be it, do not chase after the boat. In the process, I've lost several opportunities to buy into others rising pairs spotted as I'm rather hesitant. And quite honestly, there's this few moments, I actually had the thoughts to chase after the boat that had left the port! Fortunately, I remained discipline and reminded myself to hold onto my pants. Hours later, the boat started rowing back. Some even knock onto the pier and sank! Thinking back now, if I were to really chase after the boat. I would have probably drowned or get smacked by the boat when the boat is coming back! 2. Lessons learnt: Having a game plan, do not be greedy. Have a game plan. Set your target price. Hit and run. I've received a notification from Blockfolio on Sunday morning that ETH had crossed the 345 mark. Shortly after, I've set my selling order at 360.00 for ETH. However, after I've sold it, ETH continued to rally to the 370 range, before a small correction to the 35X range, and currently it's hovering around 360. How nice would it be if I set my selling order at 370? Do not fall into the trap of waiting for the highest point to sell and lowest point to buy. There will always be a better moment to buy or sell. This week had been a bull-market for the crypto world. Should the bear come out, I do not think that I will be getting the same results. At a point when ETH dived back into the 32X range, correcting from the 34X range on 15/11/17. I was actually contemplating to lock my profit and jumping onto another ship, fearing that the sell-down is actually coming. Ethereum continues to be a good candidate to hold onto for the future of technology. However, as this is a short term trade, it's best to take my profit. Just as I wanted to jump into for another trade.. a sentence flashed pass my mind. I've remitted 500 USD to my Gemini account via DBS on 27/10/17 at a rate of 1.3694 before the execution of any trades this week. As such, my capital in SGD is $684.70. As such, converting my ending funds to SGD. I'll be receiving S$979.73 worth which translates to a gain of 43.09% or S$295.03 over the week of trading! To be honest, my performance is not impressive at all when being compared with many out there. However, I'm still contented with the performance and lessons learnt this far. Beginner's luck I believe, and definitely the bull does play a big part in helping me. And yes. You can see right on top that the Forex spread is actually eating into 3% of my profits. Really bad rates yea? 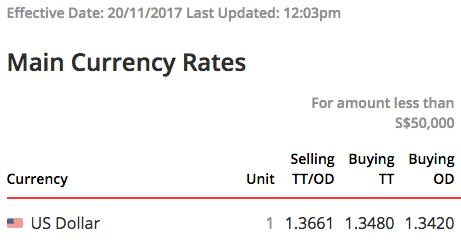 You can check on DBS forex rate here. Transaction cost - Are you a trader or an investor? Game plan and stick to it... btw, which platform are you using to trade crypto? Thanks for dropping by! I'm using Gemini as my fiat-crypto exchange and Changelly as my crypto-crypto exchange. Do look out for exchanges such as Bitfinex that is giving you a cash out on USD Tethers and not USD. Although 1 USDT represents 1 USD, they are actually 2 different thing. And unfortunately, many has failed to cash out on USDT. 43% in a week, sick gainz. Congrats! Keep it up! Thanks for dropping by! Beginner's luck, I believe. Your gains are far more impressive and there is many more to learn from you! Woah. Congrats on the huge gain! And nice progress you've got for your project on "KPO needs to lose weight!" btw, for this gemini acct, i assume u have to change SGD>USD with DBS forex rates then remit to Gemini in USD? then after you close your trades, you will need to send back in USD to DBS, then convert USD>SGD? are there any transaction cost transfering in USD back and forth? so you dont lose out on the transaction and fx rates. Thank you for the kind words and dropping by my small little blog! 1. Yes. You will have to remit USD over with DBS forex rates to Gemini. You do not need to send back your USD back to DBS after the trade. It can be stored in Gemini. Personally for me, the USD are parked in my Gemini account after trades and at this moment, I have not made any withdrawal back to my DBS account yet. For my remittance to Gemini, apart from the forex rates by DBS, I'm not charged with any service charge. 2. To my knowledge, there will be a $10 imposed by DBS for handling fee and a 7 USD by Gemini for withdrawal (Gemini-DBS), and you will be subjected to the prevailing orex rate. Personally, I have a DBS Multi-Currency Account. And I believe that I will be keeping the USD in my MCA if I were to transfer the money back to DBS. At this very moment, the USD is parked in my Gemini account, while I'm getting prepared for my upcoming trades. Hope it clarifies your doubt! one way from Gem to DBS: $10 + $17..
if i just trying for fun for the first time.. i think a few hundred bucks aint gonna cut it. using your eg of 500usd. the trans cost, assuming buy + sell.. is at least $40 bucks. thats 8% in trans cost.. dang..
the only way is to min the transfering back to DBS and leave it in Gem, and wait till the monies get larger to a few K then transfer back to DBS. Sorry for the confusion. For remittance from DBS to Gemini, there is no transaction charges. It will only apply to withdrawal transaction (Gemini-DBS). Gemini has 2FA. I’d only store USD on Gemini though. Unless I’m going to sell my ETH/BTC. You’ll need to have the BTC/ETH you’re selling in the exchange prior to the transaction. So I’d only transfer the BTC/ETH in when I’m planning to sel it, else it’ll be in my wallet. If today, I’m going to withdraw the full sum of 730 USD from Gemini, the total transaction fees ($10+$19) will be 3.9%. Like what you’ve mentioned, I think it will be better to make a withdrawal when you have a larger sums in Gemini to make the transaction fee weigh lighter in the equation. Regarding wallets, yes. GMGH have a comprehensive post about the various wallets available and I agree that it is safer to use Hard wallet like Ledger/Trezor. There have been many incidents of Coins that are stolen from the exchange. Leaving the coins in the exchange (apart from transactions) is just like putting $100 bill in a locker. Once the someone pry open the locker (exchange), there goes the cash in it. If you were to put the bill in your wallet, unless the person rob your wallet and take out the cash, else it is less likely that your cash (coins) will be stolen. Coins can be easily sent to another wallet without verification. i see.. thats quite clear on the trans cost now.. thanks for sharing these valuable info! i am sure other readers will also benefit. "All customer USD fiat funds are held in an omnibus account at an FDIC-insured bank located in the US"
Yes, I'm referring to the crypto as coins. Ahh! I was just searching for it on Gemini and wanted to copy this sentence in! The standard deposit insurance amount is $250,000 per depositor, per FDIC-insured bank, per ownership category. I doub't I will ever have more than $250,000 in Gemini though.. Haha! Wa. That one difficult la! Haha! Can you share how do you decide on the selection of the pairs? Pardon me for my lack of knowledge as I am not an expert in the trading field. But personally, I believe, to identify the pair, it's important to pay attention to the news around the crypto world and next is definitely to read about the particular coin before going into the technical part. As most coins around are peg to Bitcoin and Ethereum, you'd have to monitor them. Else, the gains from the alt coins would be wiped out if BTC or ETH is in a downwards trend. For technical indicators, I'd use RSI, MACD, it's support/resistance and Fibonacci retracement to determine it's price movement as well as trend. I'd also include Elliot's wave in to to see it's price movements, wave and cycle. It also depends on my game play. For most trades that are completed in hours, I'd also pay attention to it's volume as it is an important factor to look out on. Without volume, there would hardly be any "big" movements.